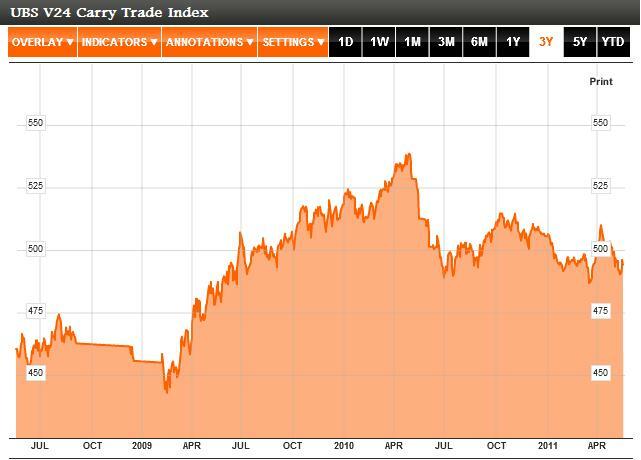 Japanese Yen Strength is Illogical, but Does it Matter? 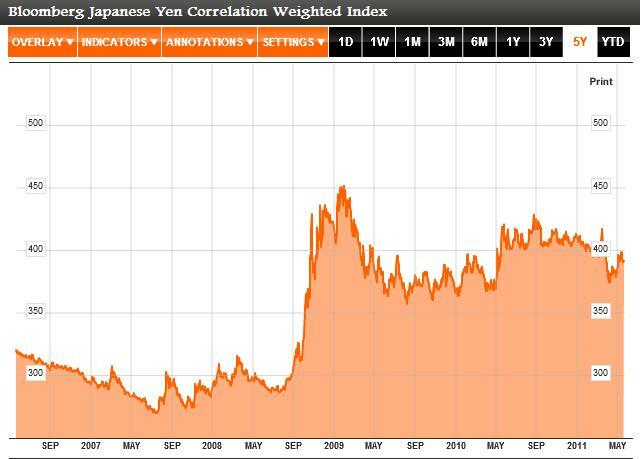 On a correlation-weighted basis, the Japanese Yen has been one of the world’s weakest performing currencies in 2011. Alas, while this information is interesting for theoretical purposes, it is of little concern to traders, who focus instead on individual pairs. Against the dollar (USDJPY), the Japanese yen is still quite strong, having recovered most of the losses inflicted upon it by the coordinated G7 intervention in March. Does the yen deserve such a lofty valuation? No. Will it continue to remain strong as the dollar? Well, that is a different question altogether. As a fundamental analyst, I am inclined to look at the data before making a determination on whether a particular currency will rise or fall. In this case, the fundamentals underlying the yen are beyond abysmal. The recent release of Q1 GDP showed a 3.7% contraction in GDP. Thanks to an interminable streak of weak growth combined with deflation, Japan’s nominal GDP is incredibly the same as it was in 1996! Based on industrial production, consumption, and other economic indicators – all of which were negatively impacted by the earthquake/tsunami – this trend will undoubtedly continue. The only force that is keeping Japan’s economy afloat is government spending. While this was a necessary response to anemic growth and natural disaster, it is clearly a double-edged sword. The government’s own (inherently optimistic) forecasts show a budget deficit of 5% in 2015, which doesn’t even include the costs of rebuilding the earthquake region. This will necessitate tax hikes, which will further erode growth, requiring ever more government spending. It seems self-evident that Japan’s national debt will remain the highest in the G7 for the foreseeable future. From a macro standpoint, there is very little to be gained from investing in Japan. The stock market continues to tank, and bond yields are the lowest in the world. To be fair, years of deflation have made the yen an excellent store of value, but this is hardly of interest to speculator, whose time horizons are usually measured in weeks and months, rather than years and decades. If not for the yen’s safe haven status, it would and does make an excellent funding currency for the carry trade. Short-term rates are around 0%, and the Bank of Japan (BOJ) has made it clear that this will remain the case at least into 2013. As you can see from the chart above (which mimics a strategy designed to take advantage of interest rate differentials), the carry trade is alive and well. Granted, it has suffered a bit since 2010, due to increased fiscal and financial uncertainty. However, given that the rate gap between high-yielding emerging market currencies and low-yield G7 currencies continues to widen, this strategy should remain viable. And yet, the Yen continues to rise against the US dollar. It has receded in the last couple weeks, but remains close to the magic level of 80, and it’s not hard to find bullish analysts that expect it to keep rising. They argue that Japanese investors are eschewing risky asset, and that the yen remains an attractive safe haven currency. Not to mention that volatility (aka uncertainty) serves as an effective deterrent to those thinking about shorting it and/or using it as a funding currency for carry trades. Personally, I’m not so sure that this is the case. If you look at the way the yen has performed against the Swiss Franc, for example, the picture is completely reversed. The Franc has risen 20% against the Yen over the last twelve months, which shows that heads-up, the Yen is hardly the world’s go-to safe haven currency. In addition, you can see from the chart below that on a composite basis, the yen peaked during the height of the financial crisis in 2009, and has since fallen by more than 10%. This shows that its performance in 2011 should be seen as much as dollar weakness as yen strength. Since I’ve spent countless previous posts explaining why I think dollar bearishness is overblown, I won’t revisit that topic here. In the end, the majority of traders don’t care about this nuance – that the Yen has conformed to fundamental logic and depreciated in the wake of the natural disasters against a basket of currencies – and want to know only whether the yen will rise or fall against the dollar. Even though, I think that shorting the Yen remains an attractive (and as I argued yesterday, comparatively riskless) proposition. Given that the dollar also remains weak, however, traders would be wise to short it against other currencies. Hey, your info always helps. Any way to buy you a beer?! PS. Spelt beer wrong in the 1st one!